We watched Tropic Thunder this week, a lampoon of Hollywood set in the jungles of Vietnam as a group of actors shoot a Platoon-style movie. Ben Stiller plays the action movie hero past his prime, Robert Downey, Jr. the ultra-serious method actor, and Jack Black the one-note broad comedy actor. Eventually, art becomes real life as Stiller's character is captured by a drug lord, and the others have to come up with a plan to save him. The funniest parts for me came from Tom Cruise playing the pompous studio head. The movie as a whole has a dark, quirky humor to it...I think it did well in theaters, but word of mouth couldn't have painted this as the goofball comedy it was presented as in commercials. 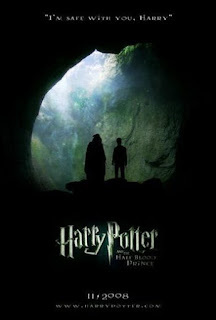 We also saw Harry Potter and the Half-Blood Prince this week. It was well-done, as they all are...a few things added and subtracted, of course. They very much played this as a set-up for the next two movies: the budding relationships between Ron & Hermione, and Harry & Ginny, along with the explanation of the horcruxes. I suppose that the book was really meant to be that as well, with such an emphasis on analyzing Voldemort's past in order to defeat him. As such, this movie didn't have as much action. There is an added scene where some of the Deatheaters attack the borough, which may have been to throw a bone to people expecting more. Even The Big Scene At The End is much more subdued, even though it's a chaotic battle in the book. Nevertheless, it told the story well and points the audience ahead, perhaps with an unspoken promise that the chaos is coming. Lessons to Be Learned by Gabriella Cilmi - I was hooked by Cilmi after seeing the video for "Sweet About Me." She'll remind people of Amy Winehouse in certain places, as she exhibits a certain 60s Motown influence, along with more straightforward pop, rock, and folk. Ga Ga Ga Ga Ga by Spoon - I saw it at the library and was intrigued. I listened and was underwhelmed. I don't hear too much that might distinguish it from much else if I'd heard it on the radio. Of course, a sampling of reviewers on Amazon indicates that if one didn't like this album, one simply needs to listen to [this other album of theirs] instead to truly appreciate their unique genius. Gee, that happens to me a lot. But if someone who reads this can indeed affirm that I've once again chosen the wrong album as an introduction, then I'll gladly try the recommended choice.